Our customized “Cool Option” consists of an optically balanced package, which provides the ability to run high-heat sensitive substrates. Our special combination of dichroic filters, hot-mirrored quartz barrier glass, and our closed-loop auto damper heat management package enables our system to cure at both low and high print speeds without the use of chill rolls. The heat management cooling system is linked through a dedicated blower, which is driven through the power supply. The system uses RTD sensors, thermocouples and an auto damper all looped through a digital thermostat for optimum heat management. The TEC Lighting lamp cassettes come standard with mercury vapor lamps. Cassettes are easily removable for serviceability and for mobility from station to station. Our multi-focal point, highly polished elliptical reflectors enable maximum UV spectral output while also acting as a clam-shell shutter mechanism, providing web protection in press idle mode. Our single Uni-Cable design provides lamp power, pneumatics and lamp controls along with the utility of quick disconnects. TEC Lighting offers a comprehensive selection of power supplies and operator control panels to meet a variety of commercial needs. 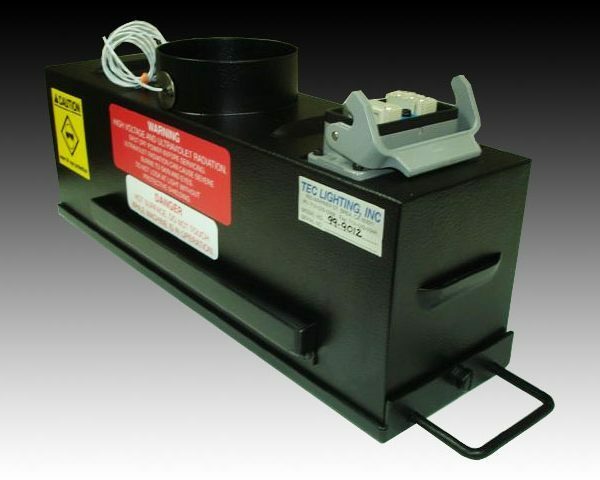 Our state-of-the-art ballast control feature maintains consistent power levels regardless of minor voltage irregularities or ambient temperature fluctuations. Available in both 50 and 60 hertz models and various voltages, all components are UL, CSA, and CE approved for the highest in quality and design. The WebCure Series 3000 command center is a logic-based relay system with (3) three manual power settings and a remote operator control panel. It is equipped with a two-position damper linked with an RTD sensor to an analog exhaust temperature controller. These interlinked components maintain constant and accurate lamp temperatures. The system is built performance tough and is very cost efficient. The 3000 series comes in single and double lamp configurations. The WebCure Series 4000 command center was designed especially for the Narrow Web-flexo market, where presses are equipped with UV interface options. These presses already have connections available, to which we can interface with features such as a shutter operation signal with real press speed and auto power-ramping. The logic-based relay system has the three power settings and remote control found on the 3000 series as well as a manual cool down mode and an emergency stop. The 4000 Series has the cooling capabilities of the 5000 Series with a digital thermostat and an auto-damper temperature feedback cooling system. The 4000 Series also comes in single and double lamp configurations. The WebCure Series 5000 command center is the thoroughbred of our systems. The 5000 Series standard PLC controls provide for easy changes to the lamp operating system. Program set-up parameters facilitate the operator/equipment interface, and a remote touch-screen interface is standard on multi-lamp systems. The 5000 Series comes equipped with the digital thermostat and auto damper temperature feedback cooling system to preserve optimal substrate temperatures. Individually programmable lamp shutter timing.